We spread, broadcast and share technical knowledge. 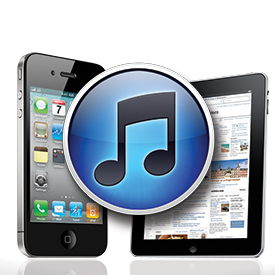 There are many problems facing iPhone, iPad and iPod users when it comes to recovering data from an iTunes Backup. Due to this complexity, I decided to write this tutorial to explain the quickest and easiest way to extract any type of files such as Photos, Videos, Contacts, Notes or Messages (SMS). First of all, this is going to be FREE (100%) and it is the best and quickest way to get that job done perfectly. By following this article, you will be able to import your data from your iTunes Backup to your desired location without any problem. Due to the fact that it relies on a free program called iTools. You can use that method to recover all your desired files from any iTunes Backup without having to restore your device so you can access them easily. Simply, make sure that you already have Apple iTunes installed on your Mac or Windows. Great, now just follow (below) four steps to get ready to extract your data from an iTunes Backup. You can get a full version of iTools for free from our download section. Please make sure to get the right version for your Operating System while there are two copies that are either for Windows or Mac. Apparently, after that you have downloaded iTools you will have to extract it from its ZIP Archive. Good thing that there is no installation for it and all you have to do is running it by a simple double click. While you are in the Welcome Screen, look at the left sidebar where you should have to click on the (Tools) option. After that, several icons will appear and what you are going to need is choosing iTunes Backups from among. It is clear from the picture (above) all you have to do is choosing your desired iTunes Backup File that you wish to extract data from it. There might be several files depending on what you have in your iTunes Backup Folder. How to Extract Media (Photos or Videos) from iTunes Backup? To recover your media files you will have to click on the (Photos) option from the right sidebar. Then, you can select the files that you wish to save and if you want to recover all of them you would have to press (Ctrl + A) on your keyboard. Now that you have your files selected and you just need to export them to your device. To do so, choose from the top bar (Export) and a menu will appear asking you to choose where do you want to save your selected data. How to Extract Contacts from iTunes Backup? To recover your Contacts you will have to click on the (Contact) option from the right sidebar. Then, you can select the contacts that you wish to save and if you want to select all of them you would have to tick first square of the (Name) field. 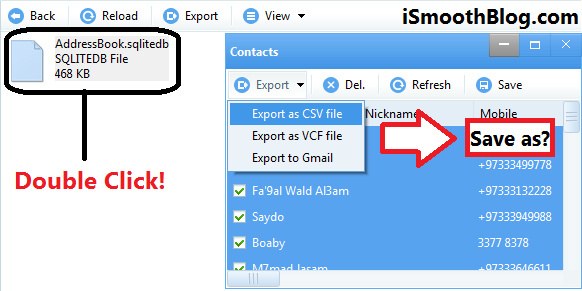 Well, after selecting your desired contacts you will just need to export them to your device. To do so, choose from the top bar (Export) and a menu will appear asking you to choose where do you want to save your selected data. Get new posts directly into your mail. iSmooth Blog. Powered by Blogger.